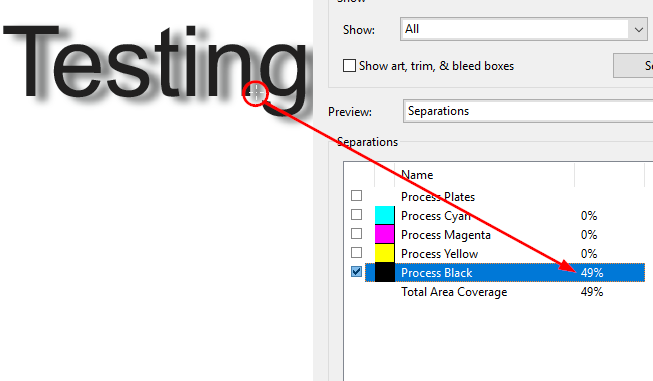 A CMYK document in Black only (100K text/50%K drop shadow) with GRACoL profile selected and embedded still converts to a 4/C Black when exported as a PDF and the embedded profile changes to US Sheetfed Coated V2. This is because Affinity applications are lying to you if you are using the standard (as installed) black swatches. See the attached. fwiw, I remade all the black swatches. Oops. I forgot to add about the drop shadow. Double-click on the swatch proxy in the Effects panel. Then switch to the cmyk sliders. You'll see it is a 4 color build. Change it to 100%k. Sorry, but I didn't use the swatches palette. I specified the text as 100% K. Your version appears identical to mine. And when I export yours as a PDF it also converts from 100K to 4/C and the same wrong profile is embedded. I.e. There is no difference between your file and mine. Works fine here. I used the pdf/x-4 stock profile. What are you using? Here's a screen shot from Acrobat and I have attached the PDF. I am using Windows, though. I was using PDF for print. When I use the pdf/x-4 stock profile the text is 100K over printing a 4/c drop shadow. Which is still wrong. Oh. Another thing. Did you make certain the drop shadow is really 100K? Any of the PDF/X profiles should work and set the document intent to your GRACOL profile. I have no idea what the PDF for Print profile is doing and I do not use it. If anything, it is broken as regards setting the intent at the document level. But the items are properly tagged. OK. 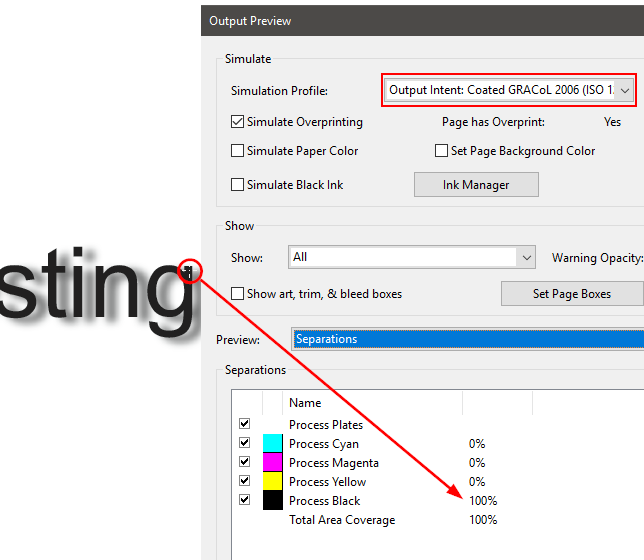 The Export for Print is setting the blend space to RGB. That is likely the cause of the issue. 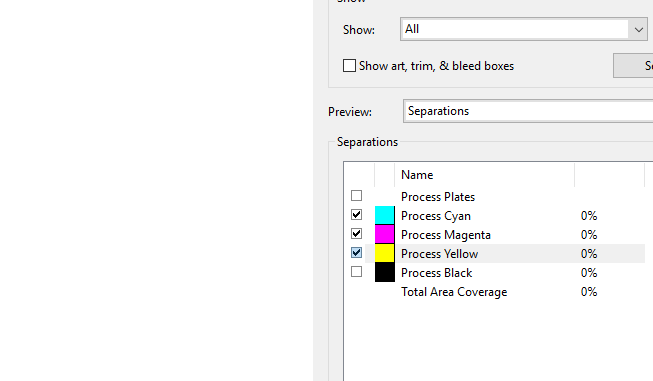 This happens no matter if one sets the export color type to CMYK or not. Yes. Is your drop shadow K only? I noticed that the Filter Effects colour pop out was showing the sliders as being 0,0,0,100 for me, but the colour shown was actually Rich Black. If I slide the K slider down and then back to 100 and then export it goes out correctly. Could you check that for us please? It could just be the Filter Effects is incorrectly showing the wrong slider position! Good, because it’s a show stopper if it’s not fixed. 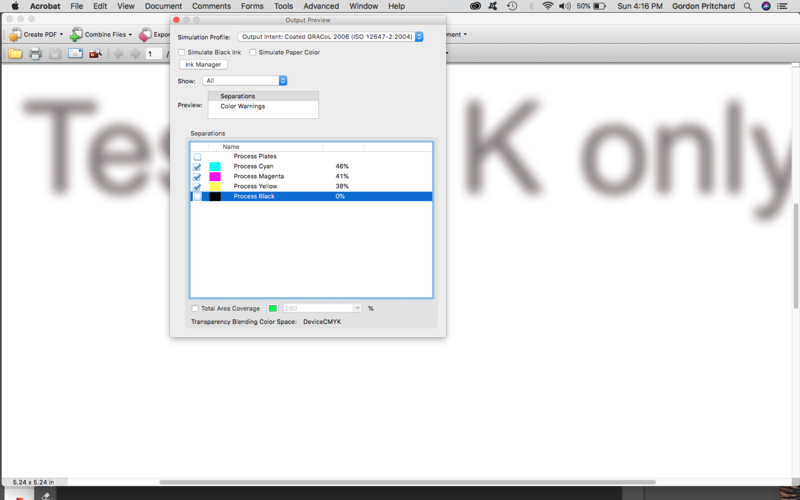 And just to be clear, this refers to a K only graphic in a CMYK document that’s exported as a PDF. How about in the current beta 238? I also need this to work but have not had time to try in latest. There is support in Designer beta (since 1.7.0.231 on Windows) for a "K only" option when placing images into a CMYK document. I do not know if it would/will affect black text when exporting to PDF, or if it only affects embedded images. I do not see any mention of this in the Release Notes for Designer on Mac, but if it's on Windows it will presumably appear in Designer for Mac, too. Whatever it does will presumably also make its way into Publisher (Windows and Mac) at some point, too, though it does not seem to be in Publisher beta for Windows yet. 1.7.0.227 is the most current version (MAC OS) - downloaded it this morning and checked again just now and Affinity Publisher says I'm up to date. Maybe it's different on Windows? 1.7.0.227 is the most current version (MAC OS) - downloaded it this morning and checked again just now and Affinity says I'm up to date. No, .238 is the most current, it simply may not be on auto-update yet. The new releases are always made available via the forums before being made available by other channels. As I said, the K Only support/option seems to currently be only in Designer, and possibly only in Designer for Windows. As Publisher clearly has the same issue, I expect we'll see that support in Publisher in an upcoming beta release, too.